'Waterman Dave' Offers Hope To San Diego's Homeless For years, David Ross, better known as Waterman Dave, has handed out hundreds of bottles of water each day. Ross, 75, is a retiree who's made it his mission to help the homeless, even if it's just with a hug or a kind word. But he says he wishes he could do more. 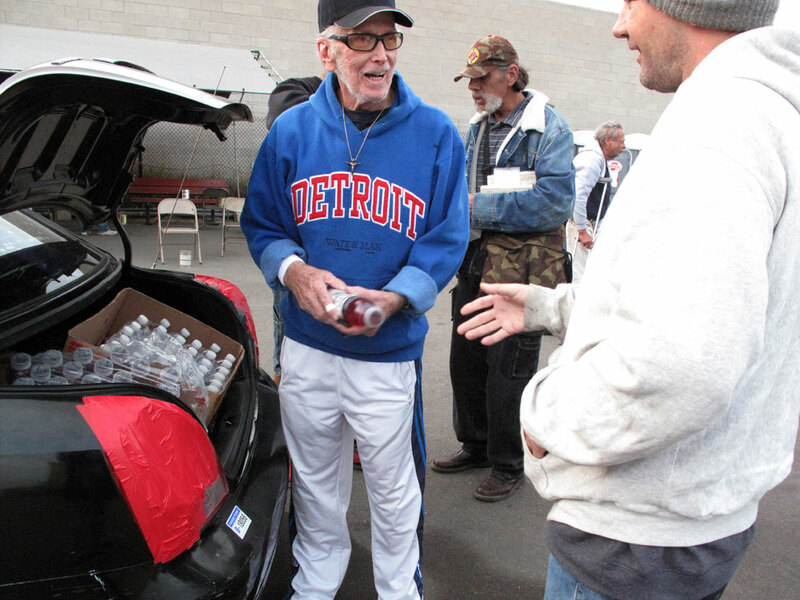 David Ross, also known as Waterman Dave, hands out bottled water and energy drinks from his trunk in San Diego. The 75-year-old retiree has made it his mission to help the homeless — even if it's just with a hug or a kind word. Hundreds of people sleep on San Diego's streets each night, on corners, beneath the interstate and across from the public library. They hang out in small groups or sit alone, watching the time pass. But when a wiry man with dark glasses approaches, everyone seems to perk up. The man is David Ross, better known as Waterman Dave. 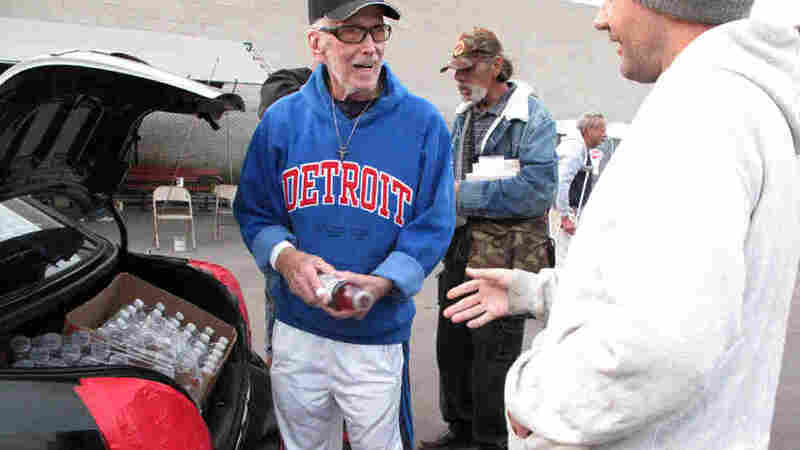 For years, he's handed out hundreds of bottles of water each day to the homeless. He's a 75-year-old retiree who's made it his mission to help the homeless — even if it's just with a hug or a kind word. Many who live on these streets turn to him for help — and hope. The city has joined about 70 others in a new national campaign to get 100,000 long-term homeless people into permanent housing over the next three years. But many of San Diego's homeless say they'll believe it when they see it. They've been disappointed before. 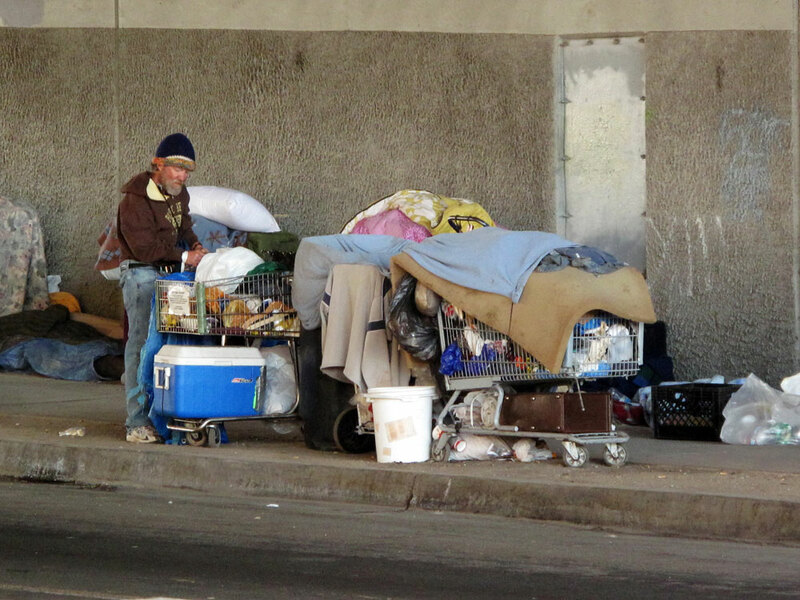 There are about 4,600 homeless people in San Diego. Many are substance abusers or mentally ill.
Men and women shout out greetings when Waterman Dave approaches in his old, beat-up black car. He calls it his "Homeless Hyundai," though he's not homeless himself. "Hey, David. It's Waterman Dave," they shout. Gray hair sticks out from under his Detroit Lions cap. The word "peace" is embroidered on the arm of his sweatshirt. It looks like he hasn't shaved for days. "Hey brother, I got some juice and stuff for you," Ross tells one homeless man outside the city library, as another kids and asks: "Do you have my cheeseburger and curly fries?" On these streets, things change in an instant. It can be burgers and fries one minute, life and death the next. As Ross chats, one homeless man, Mark Chapman, quickly pulls him aside. Chapman says he's worried about his friend Randy and points to a young bearded man, who sits curled up on the curb, his head hanging down. People Experiencing Homelessness In The U.S.
"He already took out a knife," Chapman says, making a quick slicing motion along his wrist. "And I was able to stop him from it. I put some paper towels..." he pauses. Then he adds, "I said, 'Please give me that knife.' I can't get it from him. I'm really worried about him." As Chapman talks, his friend can be seen fumbling with a pocketknife on his lap. Chapman tells Ross they were both released from the county mental health center that afternoon and decided to go drinking — a bad move. Waterman Dave sits down next to Randy to see if he can help and finds out he has a sister. "If we could call her, and let her know, would that be OK with you if I did that?" Ross asks Randy. The man nods. Then he looks up. "Why are you worried about me?" he asks. "Because I love you, man," Ross responds. "I care about you. Hey, let me ask you something, Randy. If I was laying out here in your situation, would you help me?" "God bless you, man," Ross says. "And that's why I'm helping you, because we're brothers." But it's not easy to help in a city where, as in many others across the country, social agencies are swamped. There are almost 4,600 homeless people in San Diego. Many are substance abusers or mentally ill. There are programs to help them, but not nearly enough. Sometimes an old, somewhat eccentric do-gooder is the only help around. It just makes me so sad. Because when I get out of this car right now, the only thing I can bring to them is a smile, a hug, a little encouragement and a laugh — and a bottle of water. Ross calls Randy's sister to tell her what's going on. She says Randy suffers from mental illness and has tried to kill himself before. But she lives on the East Coast, so Ross calls the police, his only real choice this time of night. The police say they're going to take Randy to a homeless shelter, but it's full. They take him to the emergency room instead. But he can't be held there against his will and he soon returns to the streets. It will be weeks before a police-outreach team runs into him again and gets him into a treatment program. Ross is discouraged. He says the city keeps promising it's going to fix things, but when he goes to a nearby underpass, he can see almost 100 people camped out for the night. "This is after a 10-year plan to eradicate homelessness forever," he says. "I wish somebody could tell me at about what level we are now in that 10-year plan." Those leading the new campaign to house the city's homeless say things are different now. Robin Munro, a local businesswoman who has helped organize the effort, says homelessness has gotten so bad that people in the city — the government, businesses, nonprofit groups — have finally come together to get something done. People line up to receive water from Waterman Dave. Aside from water, many come for the chance to joke around with Ross. "I don't think historically we've done a good job, and we weren't working together," she says. "For the first time, we have made it one of our top priorities to solve this problem." In the meantime, at a winter shelter for homeless veterans, Ross is greeted like an ice-cream man on a hot summer day. 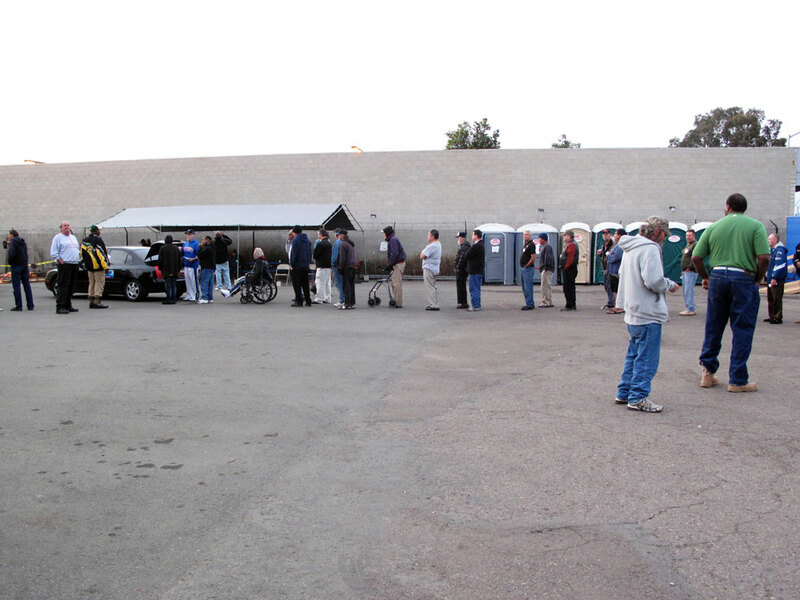 Dozens of men line up less for the water than for a chance to joke around. Bruce Bulmon, a former Marine who's been homeless on and off for 20 years, says it means a lot to these men that someone is looking out for them. "They die on the streets out here," he says. "If it wasn't for Dave, there would be nobody out there except for maybe some church groups, and it would be hit and miss." But some people here think, in a way, Ross is part of the problem, that people like him make life easier for the homeless so they're less inclined to seek help in programs that have lots of rules, like no alcohol. With his own money and donations, Ross has provided portable toilets in neighborhoods where the homeless hang out. 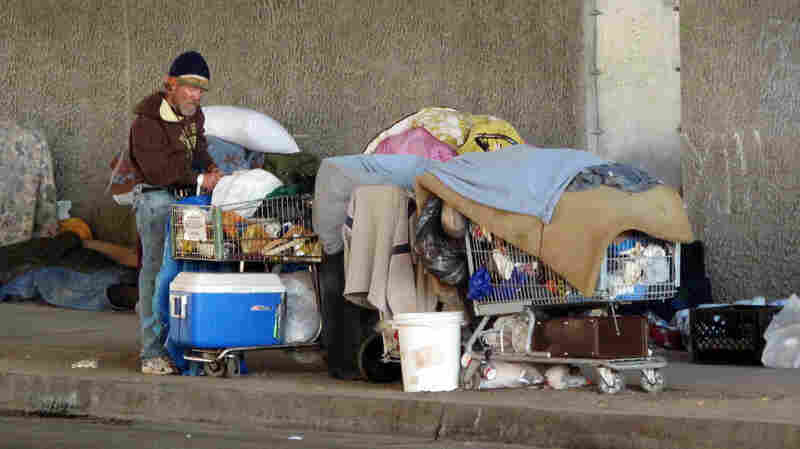 He successfully sued the city to get a place where the homeless can store their belongings, so they can go to job interviews or doctor's appointments without bringing a shopping cart. Ross says, if he's an enabler, so be it. "I've been called a whole lot worse than that," he says. "I was a car dealer, give me a break!" Ross says he helps the homeless now that he's retired because he had an unhappy childhood spending time in a boys' home. He says he understands what it's like to be unloved and discarded. Under a highway bridge where more homeless people are camping out, Ross sighs before getting out of his car. He admits he doesn't have the answers. "It just makes me so sad," he says. "Because when I get out of this car right now, the only thing I can bring to them is a smile, a hug, a little encouragement and a laugh — and a bottle of water."